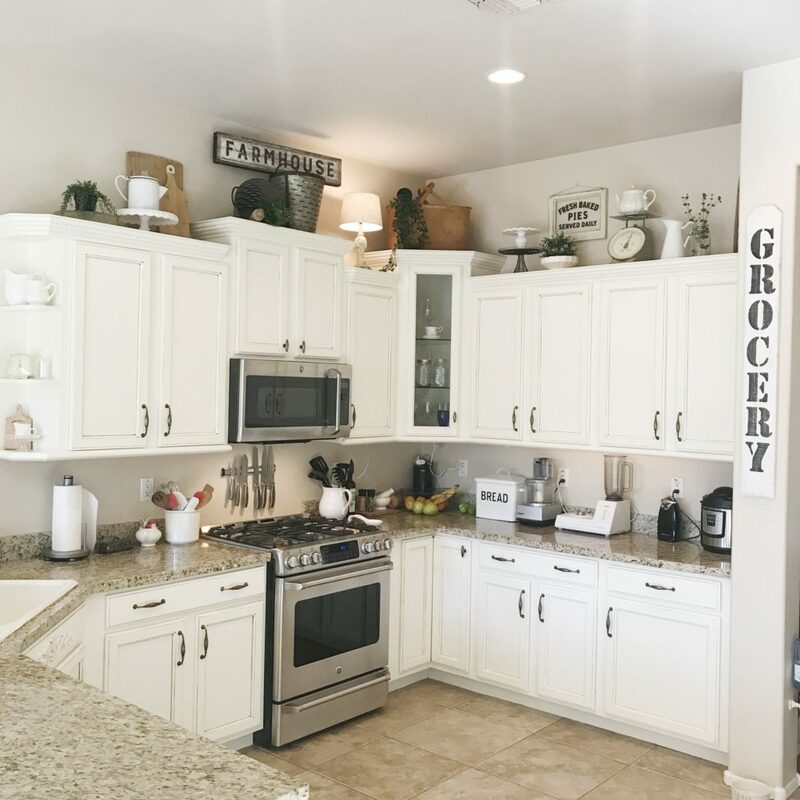 is not for the faint of heart….or sissies…or anyone that can afford to hire someone else to paint their cabinets for them. 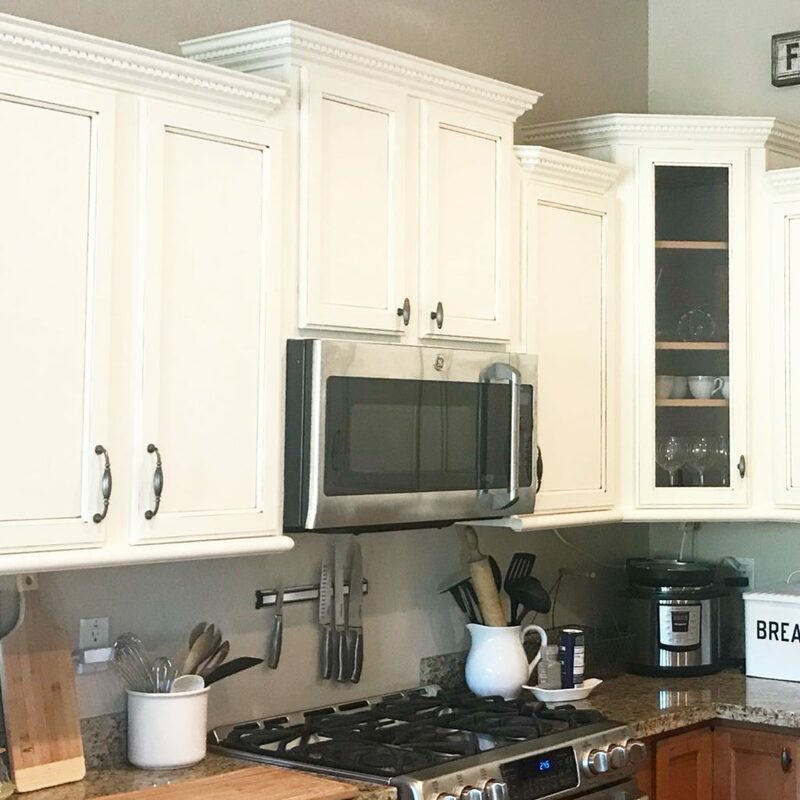 I am not ANY of those things…so I painted my kitchen cabinets all on my onesies. It really wasn’t horrible or painful or even hard…but it took quite a while. I suppose I could have knocked it out in a week or two….Yikes!….but that would have killed me I’m sure. 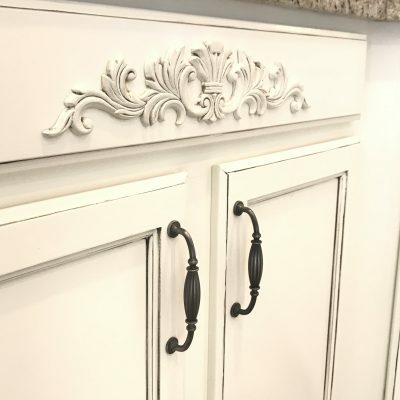 I decided to paint my cabinets in sections. 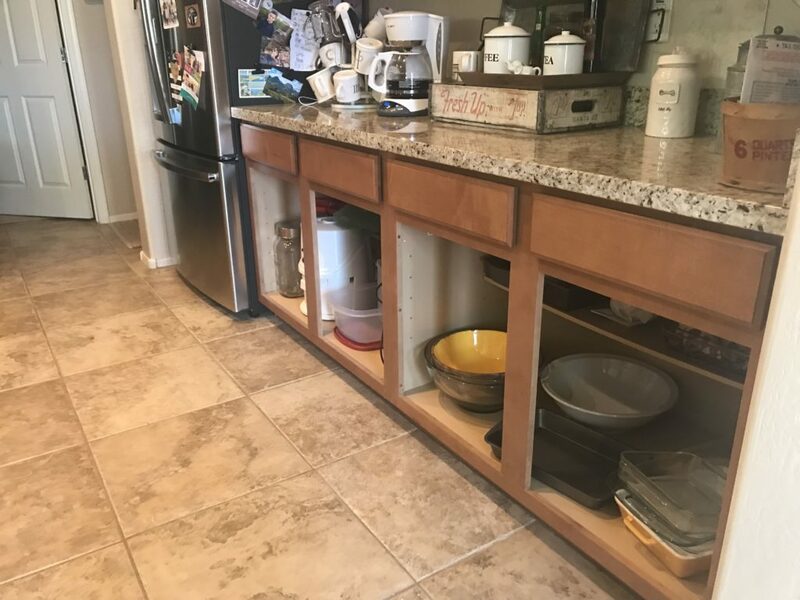 The idea of removing ALL of my cabinet drawers and doors at the same time and living in a war zone did not appeal to me at all, so we opted for one section at a time. We started with this wall that the refrigerator lives on. It’s a wall of cabinets all to itself…the dining room is at one end of it and the entrance to the laundry room and garage are at the opposite end, so it seemed a great starting point. The first wall of kitchen cabinets. 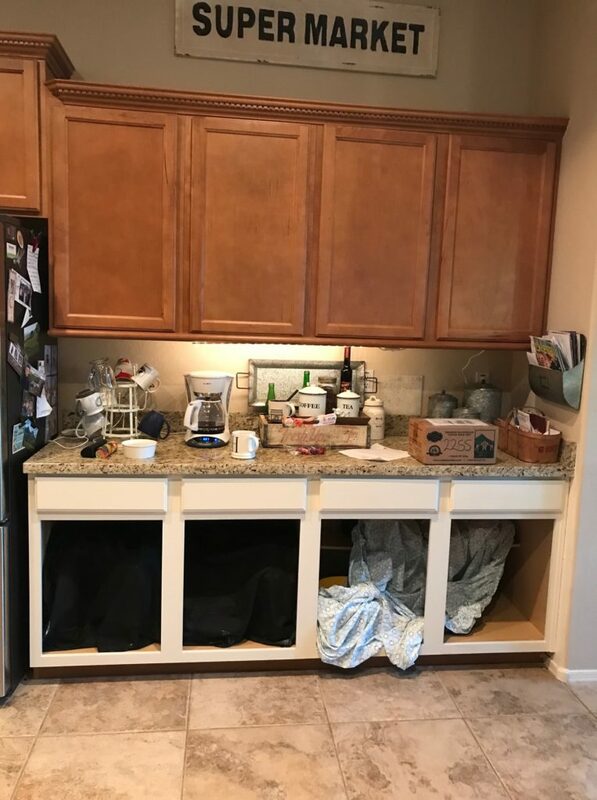 Lower cabinets get paint, upper cabinets get removed! and one evening while laying on the couch enjoying some TV (I love me some TV) I looked over at this particular wall of boring builder grade cabinets and said to Dee (the muscle behind SomethingPaintedWhite, and also my handsome hubby) “What if we took those upper cabinets down and put open shelving on that wall?” He mulled that over for a few minutes and finally said, “I don’t hate it!” He’s good like that. 🙂 So the idea had begun and it evolved as we went along. I’ll tell you all about the open shelving in another post. Mkay? of last year (I know, I know, I told you it took me a long time) after MUCH research (aka Pinteresting) on what is the best way to paint cabinets, including what kind of paint to use, what brush, to prime or not to prime, how much coffee to consume while painting cabinets, etc., etc., etc., I made up my mind that it was time to get started. I took off the first 4 of many cabinet doors, and dove in head first. 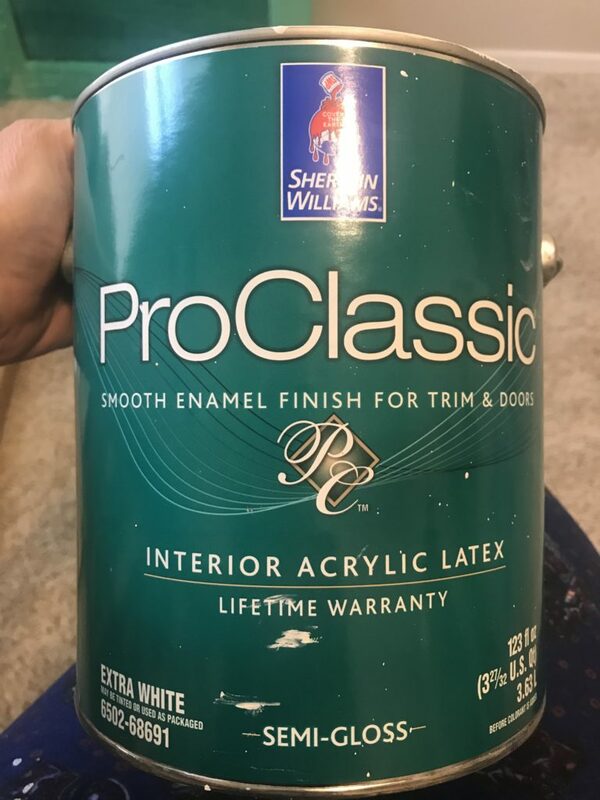 Pro Classic Trim and Door Paint. I had used this very paint….in this very color (Dover White) about 3 years ago to paint the bottom of my dining room table. That table gets kicked and bumped with the vacuum on a regular basis, not to mention it has moved from Washington to Arizona and was even stored in the back of a moving truck for 2 months in the desert heat….and it’s never required a single touch up, that was all the criteria I needed when deciding which paint was best. 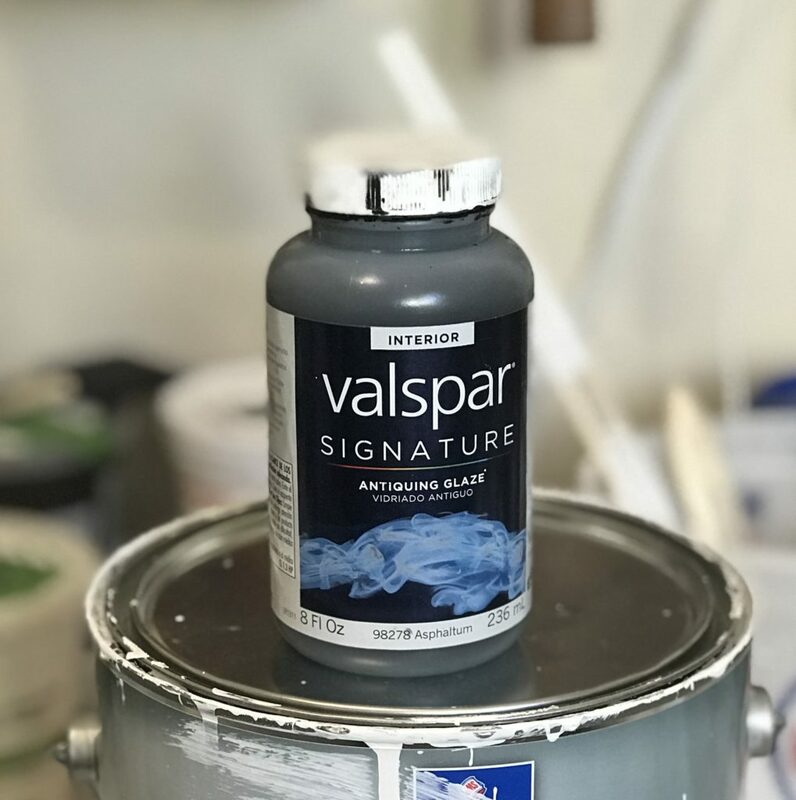 This paint has held up so well on my dining room table base that I decided it would be just the ticket for painting my kitchen cabinets! I gave the doors (both sides) a light sanding with 150 grit sandpaper wrapped around a sanding sponge. I really only sanded them enough to get the sheen off and give the wood a bit of grip. As an avid chalk-painter this is a new step for me, but because of the paint I’m using for this project, the waxing step is eliminated at the end so it balances out. 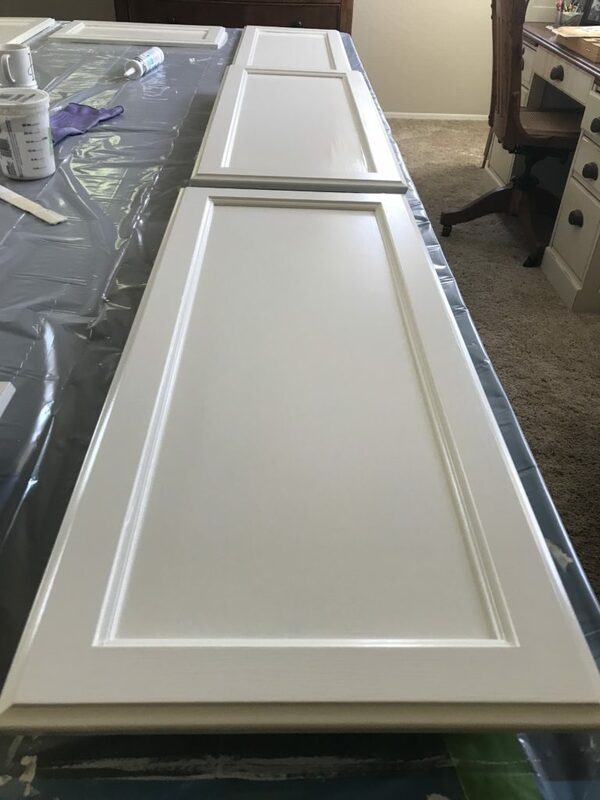 Painting the first 4 cabinet doors inside…It’s too hot outside! earlier that I started this project one day in June??? 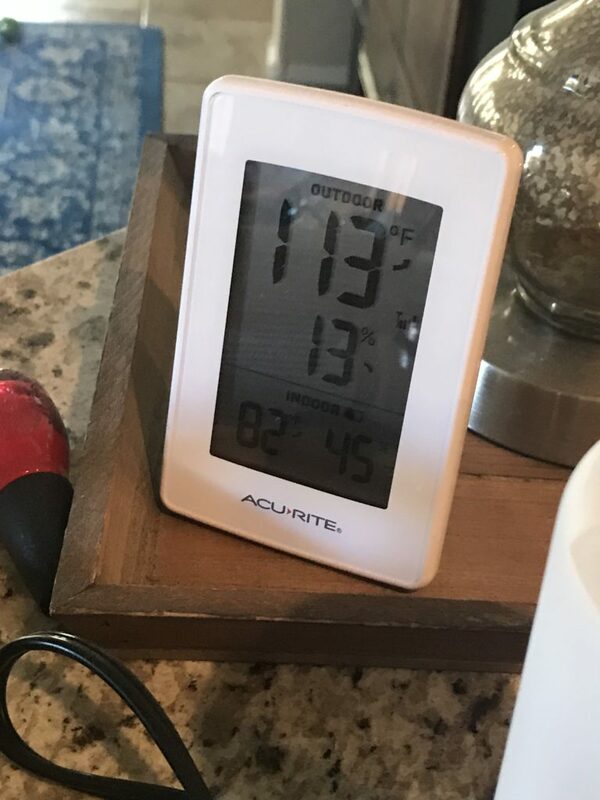 I live in Phoenix…June in Phoenix is no time to be doing ANYTHING in the garage…I have a bedroom turned painting room/workshop inside my house so that I can paint while enjoying the A/C. 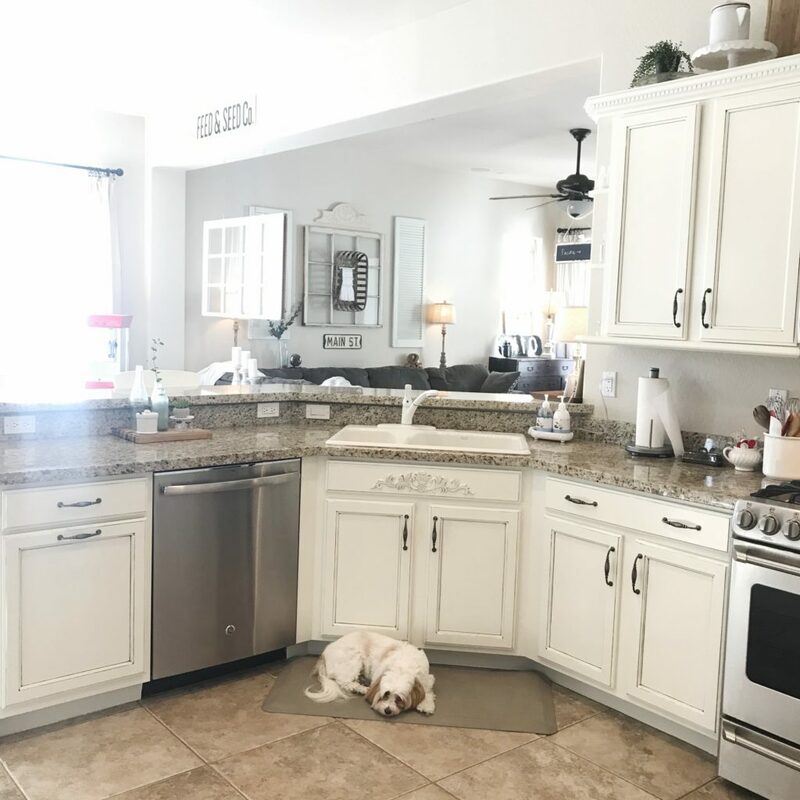 I never once felt like this paint had a strong odor…I really love this paint and intend to use it on all the cabinets throughout my house. This is why I paint indoors in the summer here in AZ! When you need more space for painting, a ping-pong table comes in handy! 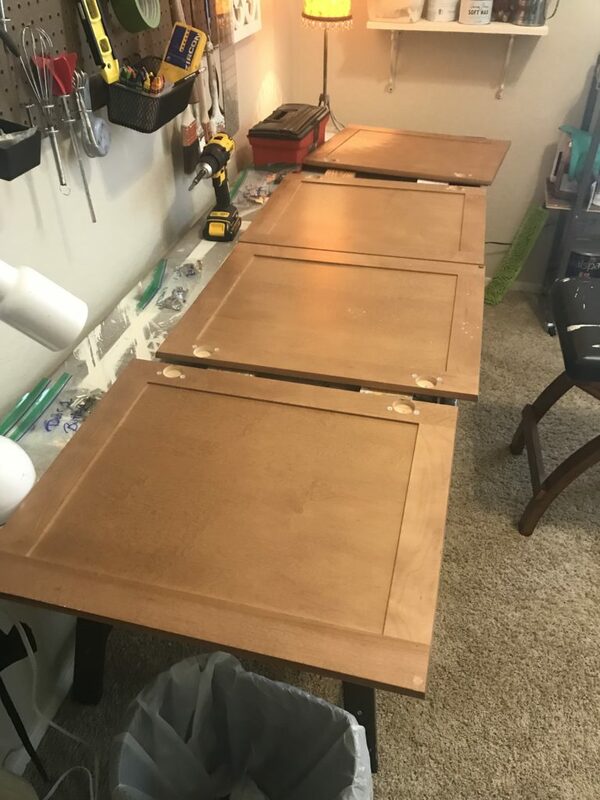 Ping Pong tables make a great place for painting lots of cabinet doors at once. 🙂 You’re welcome! I need a lot of work in the picture taking category. I didn’t get one of this section with primer only, but here it is after the face frame and drawers are painted! Looks better already! after two coats of Dover White…I knew it needed something else. Dark wax? Glaze? Hmmmmm! Well…I’ve used Annie Sloan Dark Wax many times so that seemed the best answer. It was a bit more work than I liked. I used a tiny artist brush to get the wax down in the crevices and along the front lines and then I had to try working it in without actually wiping it off, apparently I wasn’t thinking about the fact that since I didn’t use Chalk Paint the wax didn’t behave quite the same way. But I kept at it until I got it looking like I wanted…and I like it. A lot! But I decided to try something else on the rest of the doors and drawers. Valspar Antiquing Glaze in Asphaltum. I was worried it would be too dark…and it’s definitely darker than the AS dark wax, but it’s easier to work with on this paint and i really like the end result. One tiny little bottle of this stuff lasts Forever!!! Yay!!! I used the same technique to apply it…but working it in is so much easier…just a swipe of the finger (dampened from the moist shop towel in my other hand) and this process goes fairly quickly. The nice thing about glaze is that it’s forgiving. It takes a while to dry so if you get too much on or get it in the wrong place, it’s super easy to wipe off and start over. Yay! I did that many times. Just sayin! Yay!!! 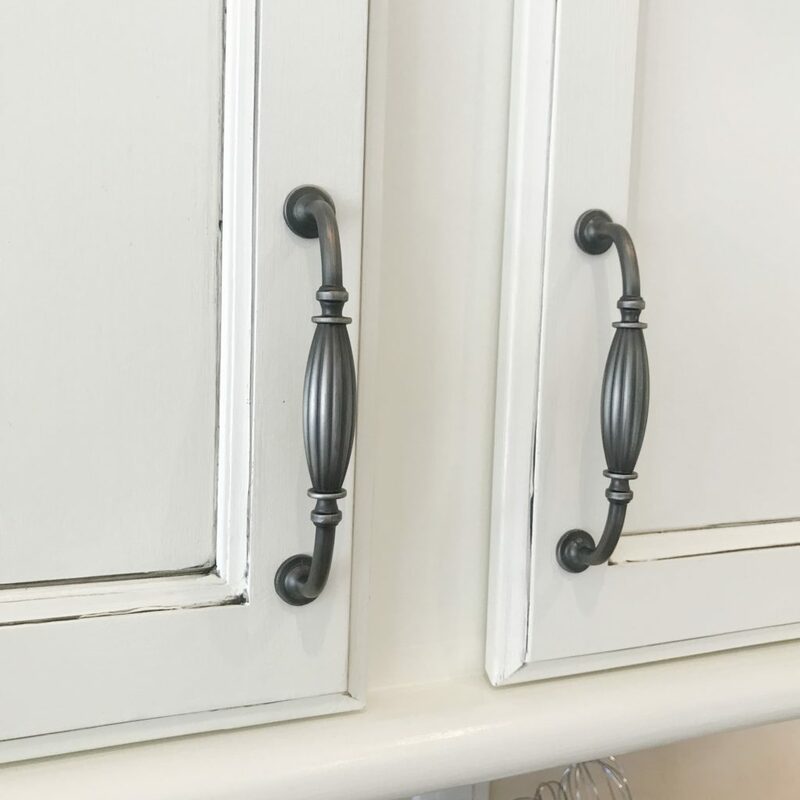 I searched and searched and finally found these fabulous french country handles at cosmas-hardware.com. They were exactly what I had visioned and I love them! They’re just fabulous and are super good quality, I can’t believe how inexpensive they were, $2.30 each. Right?!? I needed 28 of them so that was very appreciated. thank goodness. I made a template out of a big plastic ruler thingy, I even drilled holes in it so that i would be sure that my hardware would be perfect. It worked great and I’m thrilled with it. I love having hardware on my cabinets!!! I quickly realized that drilling the holes for the hardware AFTER painting the cabinets was not a great idea. The paint really needs about a 7 day cure time to harden completely and since I have no patience I drilled the holes as soon as it was dry which caused a tiny bit of peeling just around the hole. 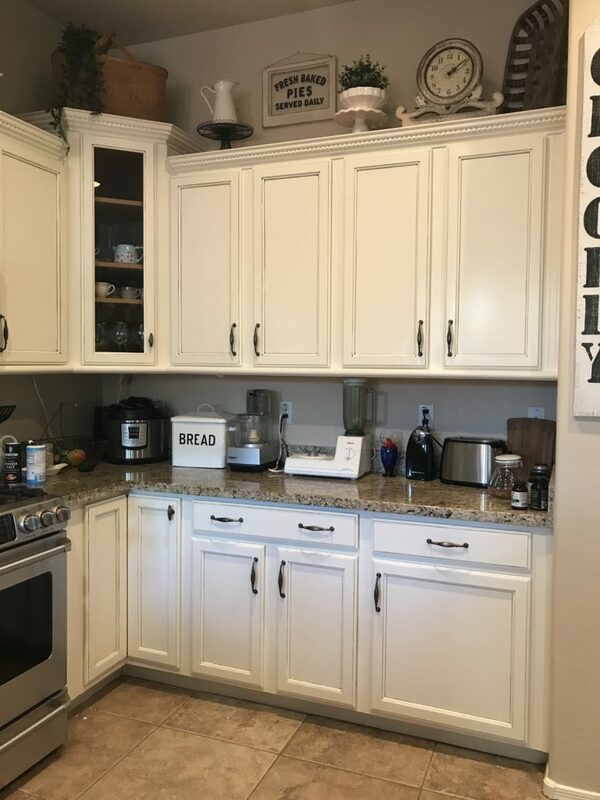 It didn’t cause any issues because the hardware covers that up but I did decide to go ahead and install the hardware on all of the cabinets so that when they get painted, the holes will already be there. And now, looking back, I’m really glad I did that because it worked much better for painting. The first section of the kitchen cabinets is complete! 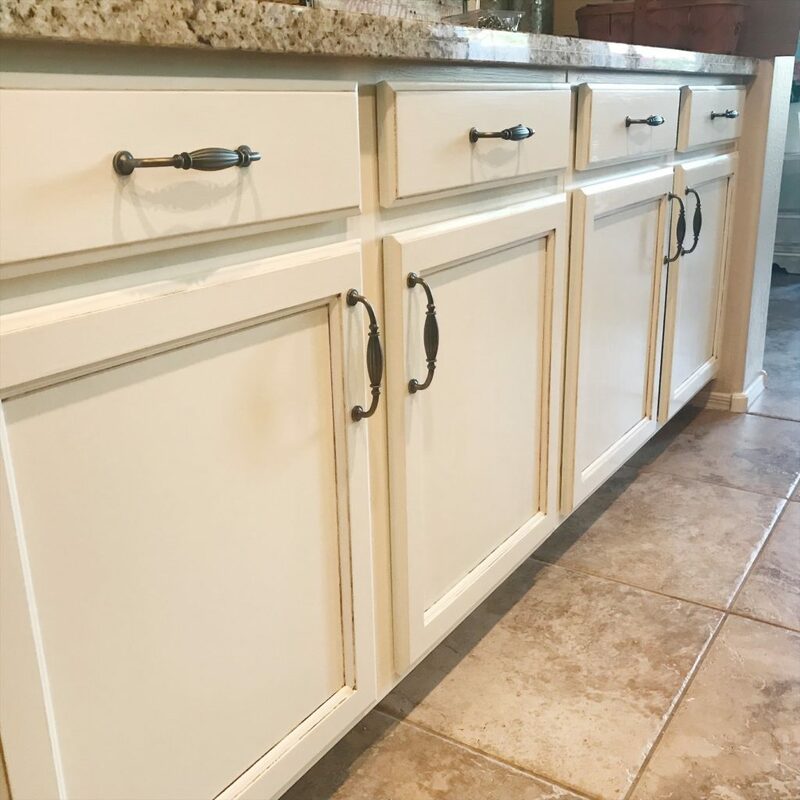 the cabinets are finished and I love them! Now don’t be discouraged and think that it takes 7 months to paint kitchen cabinets. It does not! I completed many other small projects in between working on cabinets, took 2 out of state trips, was down with a bad back a few times and various and sundry other distractions. 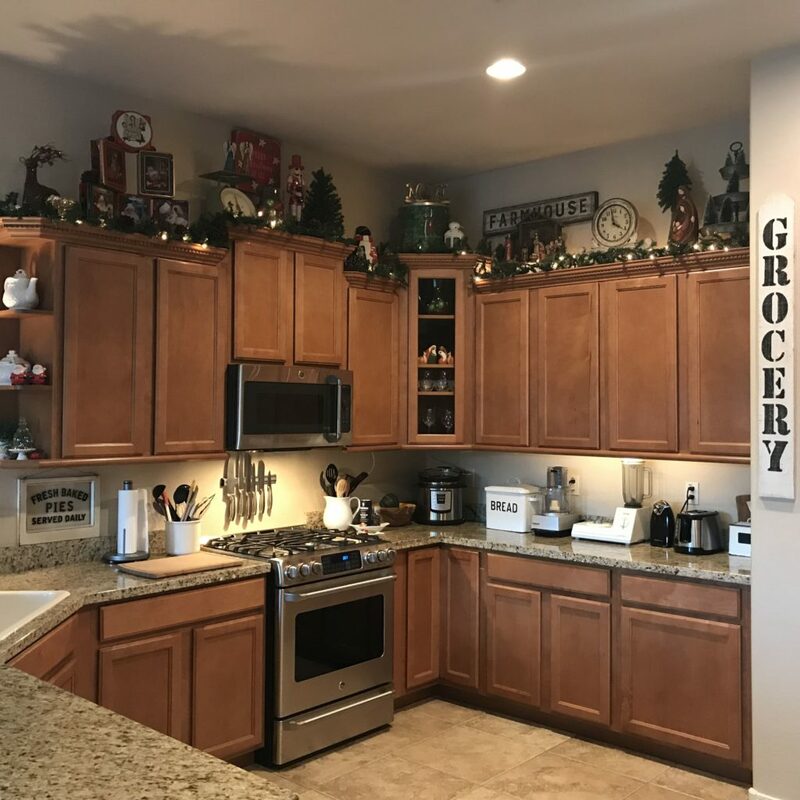 Doing the cabinets in sections worked out very well for all of those reasons I just listed. As soon as I started on a section…I worked at it until it was complete so that our kitchen was always functional. The final section is complete! Yay!! 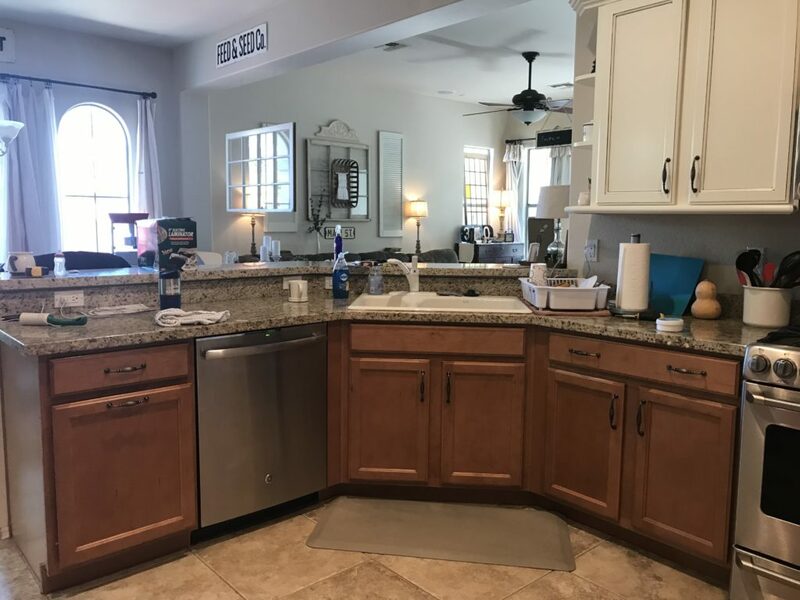 Would I paint kitchen cabinets again? Good question! 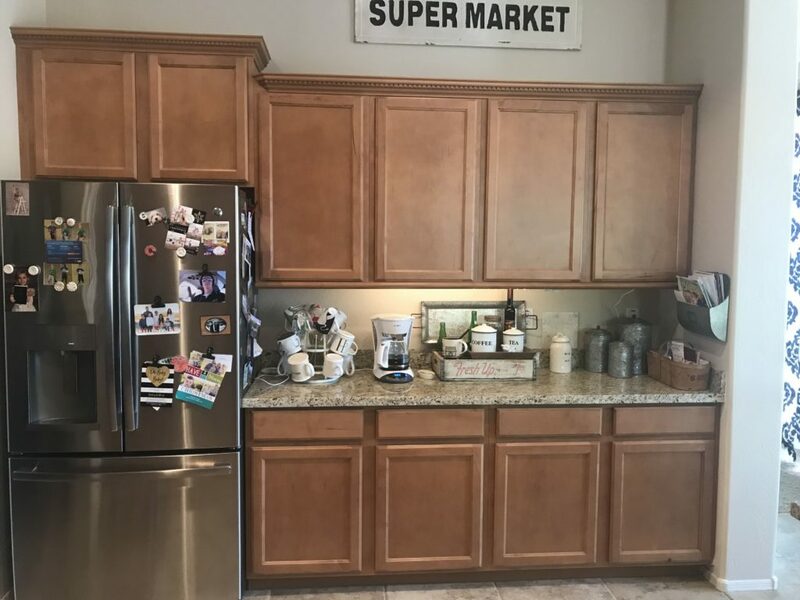 If the day ever comes that we sell this house and buy another one with boring builder cabinets, I would most certainly have to paint them because having my creamy white kitchen cabinets makes me very happy. But cabinet painting is far from behind me at this point. 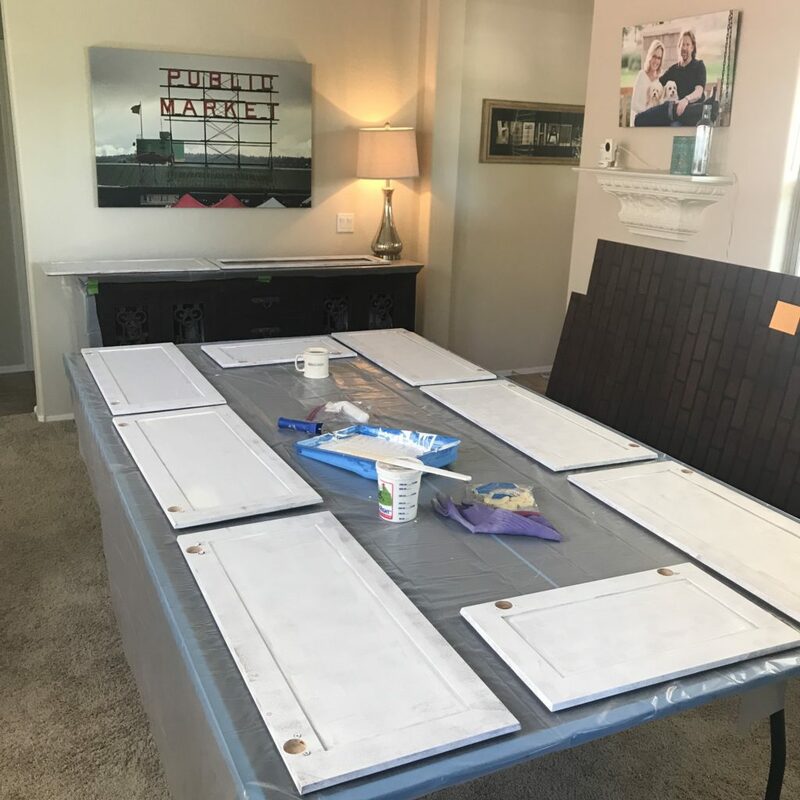 I still have two vanity’s in my master bathroom, cabinets in the guest bath, hallway cabinets, a linen closet, and a built in bookcase which means…..well, it means I better get busy, I’ve got stuff to do. Here are a few more pics for you to enjoy! 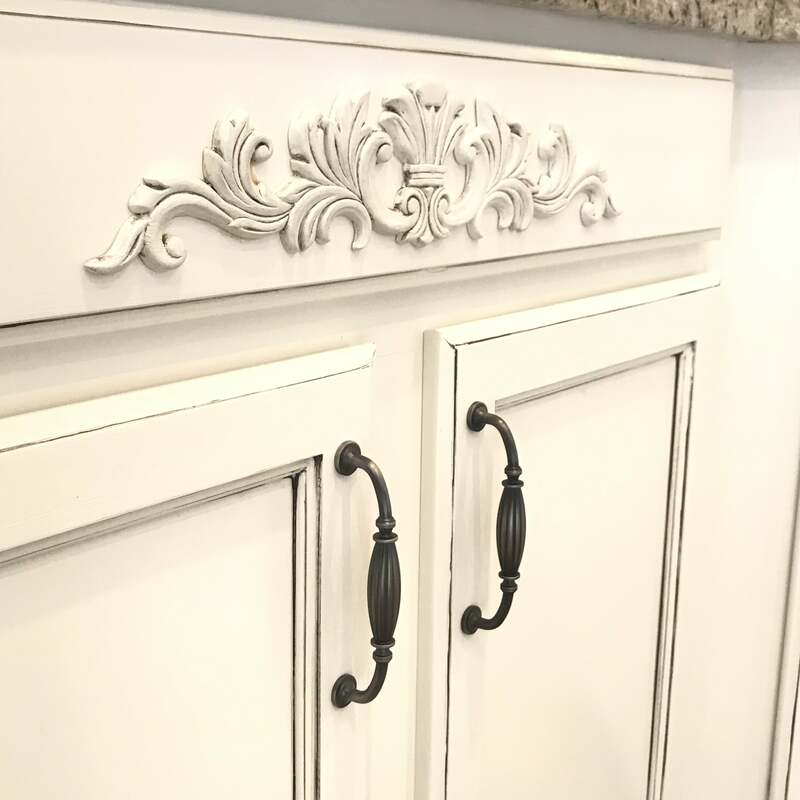 Hello French Country Kitchen Cabinets!!! Second and Third Sections complete! Happy painting my friends, have a wonderful day!! !